Green beans, onions, the first tomatoes and potatoes, and the last of the lettuces are here. Celebrate the transition from spring to summer with this fantastic salad. Brush the onion slices with olive oil and salt them lightly. Roast in the oven until golden brown, turning once in the process. Should take 20-30 minutes. Remove from oven and let cool. When cool, separate into rings. Boil a large pot of water. Put the whole potatoes (skin on) into a colander and lower into the pot. Boil until the potatoes are “fork tender,” about 20 minutes. Lift out colander and set potatoes out to cool. Put green beans (stems removed) into the colander and lower into the still-boiling water. Blanch for four minutes. Lift out colander and lower into the ice water bath to stop the green beans from cooking more (they will get mushy and continue cooking if left hot). Cut the cooled potatoes into wedges. Cut the tomato into similar sized wedges as the potatoes. Place the tomatoes, potatoes, green beans, capers, and onions into a very large serving bowl. Whisk the mustard and vinegar in a small bowl. Continue whisking, adding the half cup of olive oil to make a dressing. Drizzle the dressing over the cooked vegetables. Salt and pepper to taste. Just before serving, toss the vegetable and dressing mixture with the salad greens. Serves a small army. Tastes like summer. A couple notes here. To seed a tomato, just slice it in half first, and gently squeeze out the seeds and tomato “goo,” leaving the flesh, skin and “ribs” of the tomato intact. 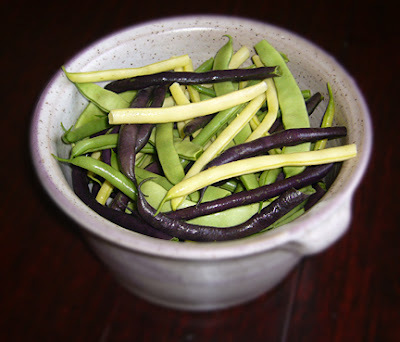 Also, the purple green beans are a lovely eggplant color. This will turn to dark green when cooked. So, if you look in the pot and wonder, “Hey, where’d the purple beans go?” now you know. We had a rough spring with that loathed cold snap. It hurt all the farmers. Our CSA is starting nearly a month late. We see the grower at the market selling a few things he does have, that are not enough yet to fill the CSA bags for a week. I bought some chard and kale from him. But as we walked away, he ran after us. “Hey, you forgot your onions and radishes, oh, and some of these.” he said, running off before I could protest. The bag contained a large bunch of green onions, radishes, three small heads of bok choy, and a pound of fresh baby arugula, and a small greenhouse grown cucumber. He would not take any money for them. Sunday night, I contemplated the market bounty. I needed to use it, but did not have time to make many different things. Then, I thought, what about a stir fry kind of thing? Can you mix all these and have it work? The end result has lots of flavor and texture with the mix of spring vegetables. It turned out way better than I thought it would. 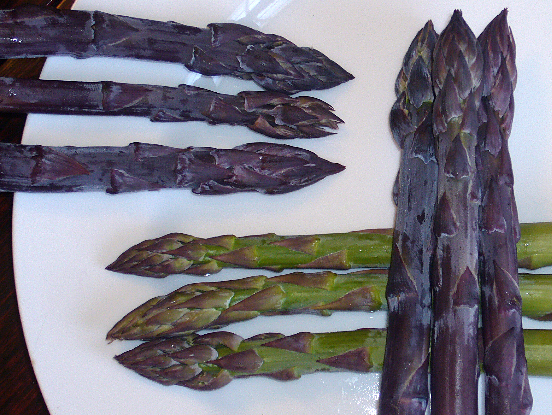 Steam the asparagus tips in a steamer for 7 minutes. Heat oil in large dutch oven. Saute garlic and sliced green onions until just golden. Add honey, zest, juice, salt and pepper flakes. Stir. Add the chard, kale, and bok choy. Toss to heat through, just until it starts to wilt, about 3 minutes. Add black pepper to taste. Add the asparagus tips, still hot, and toss with the greens to mix. Serve immediately. It’s still good the next day, but it’s really good with all that texture. Much better than a mushy pile of greens. Off to the Market this Weekend? There should be plenty of happenings at the local Farmers Markets this weekend! While the Brookside market is already going for the season, this weekend is also the Brookside Art Fair so you can get art and artfully grown produce all at the same place! Overland Park's Farmers Market will feature a T'ai Chi demonstration and a band. Look for more vendors and more produce as spring has finally arrived. KC Organics and Natural Farmers Market opens tomorrow, 5/5. 39th Street opens on 5/9. Have a wonderful spring weekend! Eggs can be found in several colors besides white or brown. The shells can be pink, speckled, blue or even green. The color of the eggshell has nothing to do with the flavor or the nutritional value of the egg. Both of these depend on the diet of the chicken, how it is raised and the freshness of the egg. There is a lot of confusion, however, with all the terms regarding eggs. Caged, Cage-free, Free Range, Pastured, Vegetarian-Fed, High-Omega-3 … what does it all mean?